We begin by carefully researching and studying photos of what we wish to sculpt through books, via the internet and observing the real thing if possible. Once we have good photos from all different angles and enough knowledge of what we are going to sculpt we do a rough sketch to get the right proportions. The sculpting is done in clay or wax. We generally prefer wax for sculpting smaller pieces like this frog pictured. The wax is heated up in a cook pot as pictured and then we build up the sculpture slowly piece by piece rather than carving out the sculpture from a solid block. Anything can be used to help sculpt from cooking utensils, pieces of wood, dentist tools and often we make our own tools. Once the wax sculpture is finished we then take a silicon rubber mould which is enclosed inside a plaster casing to help keep its shape. After the silicon rubber mould has been made of the bird for example we can then make a couple more waxes of that bird by pouring hot wax into the mould so we now have three wax birds. 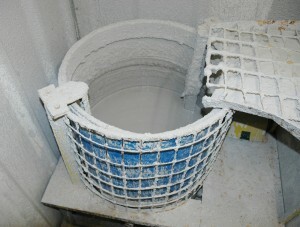 Once the waxes have been checked and touched-up they are ready for casting. The three wax birds are attached to a sprue so they can be dipped in a slurry or ceramic shell which just looks like slightly thick paint. The waxes need to be dipped in this slurry 5-8 times, allowing 4 hours between coats, so it forms a complete shell around the waxes. Once this dipping is complete the wax birds are turned upside down and the wax is melted out of the ceramic shell through the sprue so you just have an empty ceramic shell of the birds. 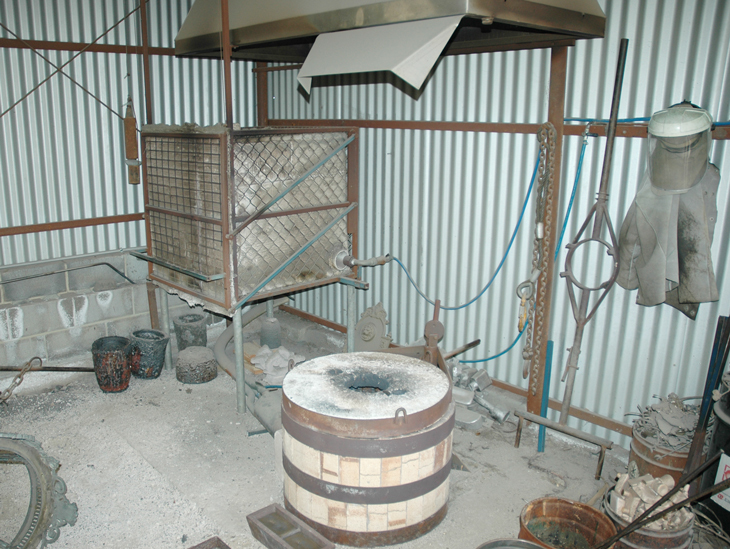 The silicon bronze is poured into these shells at 1400 degrees/2552 farenheit in Australian foundries so the bronze just looks like lava. This process of changing the original soft wax sculpture into bronze is known as the “Lost –Wax Process”. This type of casting picks up the minutest detail of the sculpture thereby guaranteeing pieces of art of exceptional quality. Small sculptures are cast as one piece however large sculptures need to be cast in a number of pieces and then welded together. After the sculpture has been assembled it is then sandblasted. 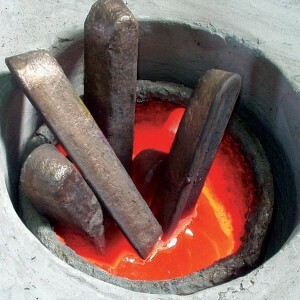 This is basically firing small pieces of garnet at the sculpture which cleans the outside of the sculpture. 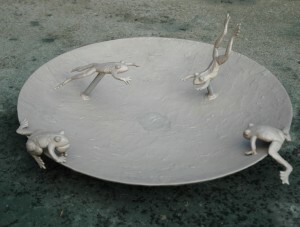 The Frog Birdbath Bowl sculpture pictured here of the Frogs has just been sandblasted revealing the dull gold color of the raw bronze. The final step is putting a patina on the sculpture. This involves spraying a couple of coloring agents onto the raw bronze a number of times giving it a deep, rich bronze color. It is also possible to vary the colors from a bright gold to a black which can be a nice contrast. We often highlight many of the birds beaks for example in gold. Now the sculpture is finished and ready to enjoy in the garden.